Delicious fresh bread is one of life's pleasures, but it still has to be cut properly. 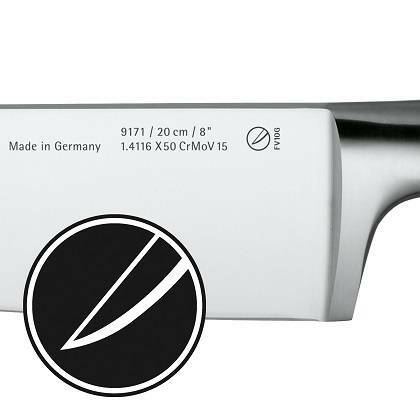 With a WMF bread knife, every loaf of bread can be sliced up to provide a tasty base for butter, cheese, meat, jam - as you please! Cutting bread properly is an art form! Surely you know this all too well – slices of bread that are unevenly thick or crooked can really spoil your breakfast or supper. The trick here is to use an electric bread slicer or a WMF bread knife. The coarse serrated blade and the long cutting edge ensure that every slice of bread can be cut cleanly and effortlessly. Our bread knives in a variety of designs are suitable for thick brown bread and airy white bread as well as for the heartiest of wholemeal breads. 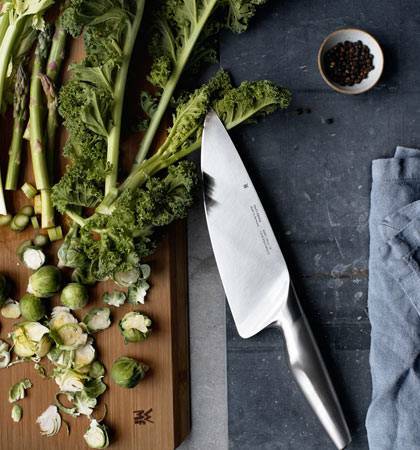 Even grain on grain is no problem for the high-quality knives in our assortment. The powerful blades that break through the crust of the bread in the first cut and then move smoothly through the loaf afterwards are also suitable for soft fruits or soft bakery products like croissants thanks to their special design. The different bread knives complement one another in our line-up of kitchen knives and are a mainstay of various knife sets. 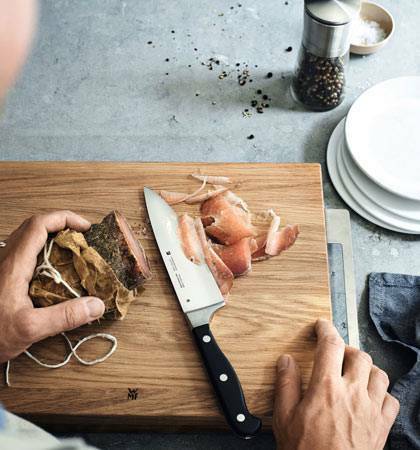 A dependable bread knife is part of every basic kitchen set and is one of the most important cooking tools around, along with the cookware and kitchen gadgets. WMF bread knives are listed in various sizes and designs in our product range. The various collections may vary in size and look, but they all share the same high-quality forged blade and workmanship. Products with Performance Cut Technology with extra-refined special blade steel come especially recommended. The extra-sharp manufacturing process is not only practical for bread knives but also for the blades of other types of knife. 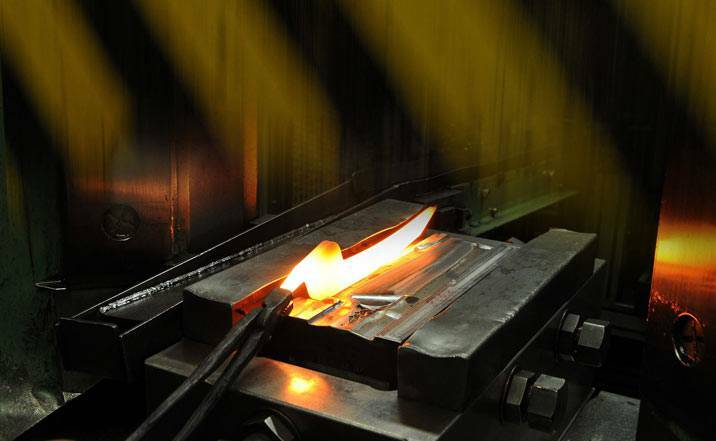 Performance Cut blades are also used in utility knives, carving knives, chef's knives and universal knives among others. Our "Grand Class" knife collection was awarded top marks. It scored highly for the ergonomic design and being easy to clean as well as for the sharpness of its blades. 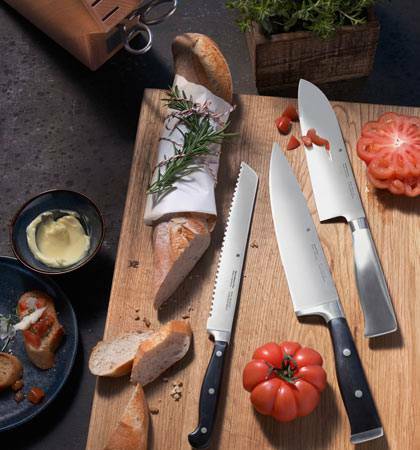 Like all our knives, the bread knife also impresses with its excellent workmanship – the joint between the blade and the handle is smoothly designed. This guarantees a long lifespan and hygienic performance. Bread knives are important kitchen tools and ideally complement cookware and kitchen gadgets. 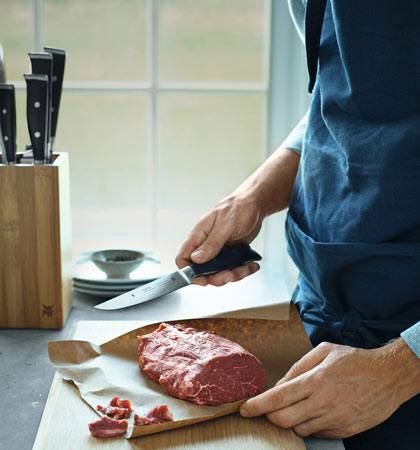 All WMF knives and other kitchen utensils, plates and cutlery can be found as part of harmoniously coordinated collections with our proven WMF quality.